Denver Broncos linebacker Von Miller says NFL players need to take a page from their NBA counterparts and be aware of their opponents' safety on the playing field. "They're playing hard, and the superstars are going to be superstars, but they're always taking care of each other," Miller said this week. "There's never crazy-hard fouls that can lead to somebody getting hurt. That stuff happens in basketball, but it's never intentional. "In basketball, they take care of each other. Football is a more physical sport. But we've got to start doing that. We've got to take care of each other to continue to make our game great." 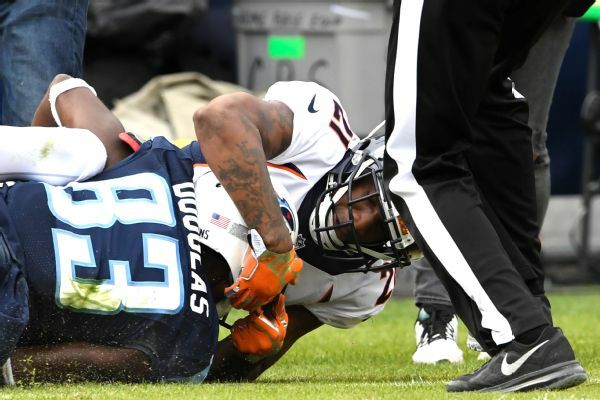 Miller made his comments in the wake of Harry Douglas' low block on Broncos teammate Chris Harris Jr., which spurred Denver's Aqib Talib to retaliate against the Tennessee Titans wide receiver and fueled harsh words for Douglas from several Broncos players after the game. Miller said the proximity of Douglas' block made it even more egregious. On the 6-yard run by the Titans' Derrick Henry with just over three minutes left in the first half,Harris was standing away from the pile in the middle of the field when Douglas dove at the cornerback's right knee. Harris fell to the ground, clutching his right knee, but he was able to return for the second half. "Chris, he wasn't even involved in the block. The play was completely on the other side," he said. Miller expounded on his comments in a telephone interview with SI.com. "In the NBA, you see it all the time. You know, guys can go up for a huge dunk, and you see a guy coming in and trying to defend the shot or the dunk, and he eases up a little bit. He takes care of his opponent," he said.